Up until now, the field of digital marketing was primarily confined to gadgets like smartphones, laptops, and computers. The integration of digital marketing with the physical world has been minimal. However, digital signage is changing all of that. It is trying to amalgamate digital marketing into the physical world. It is the main reason why it has such a lot of potential. Digital Signage – Is it the future of digital marketing? Digital signage refers to the actual digital boards which can be set-up in physical locations. The advantage is that they have 24x7 internet connectivity. That is why; the advertisers have an option to change the ads with the click of a button. Real-time bidding on such ads is possible. Instead of viewing these ads on computers, visitors can see these ads in the real world. The advantage for the advertisers is that not only physical interaction with the ads is possible, but also they can tap into a broader audience in a particular geographic location. The real-time bidding allows advertisers to adjust their campaigns as per the requirement and the response. The digital signage industry is also evolving at a rapid pace. 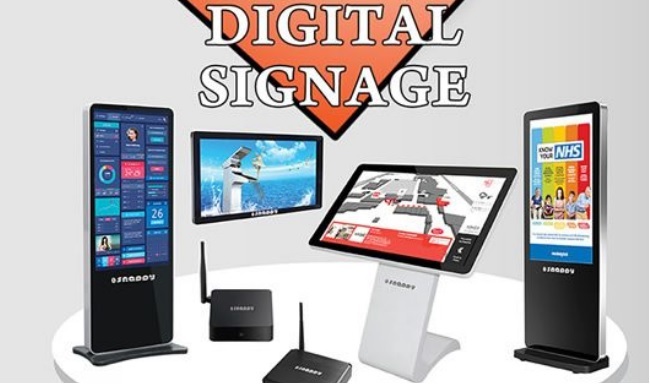 There are quite a few emerging trends in the field of digital signage which indicate that digital signage is the future of digital marketing. One of the main advantages of digital signage is that they offer a touchscreen and sensor-based experience. That is why; the users can interact with the advertisements. The increased interaction provides a higher conversion rate for the advertisers. Moreover, the advertisers can easily capture more data which will help them get more value for money from their advertisements. Since the content is digital, the cost of displaying the content or interacting with the potential clients is on the lower side. It is the main reason why the brands are switching over to digital signage rather than the traditional methods of advertising. Most of the companies that offer digital signage options are introducing AI into the signboards. With the help of AI, the advertisers gather proper data. The data can help advertisers offer smart advertisements. With appropriate tracking and real-time analysis, the ads can be made more interactive and intelligent. With that, the conversion rate also increases. It will allow advertisers to reduce their advertising budgets and get a better ROI. The use of AI and data collection systems is another emerging trend in the digital signage industry. The core of the digital signage industry is dependent on the merger of the digital world with the physical world. With real-time tracking and online bidding for advertisements, the line between the physical world and digital marketing is blurring at a fast pace. Moreover, augmented reality and virtual reality are the next steps which digital signage industry can take to blur the lines even more. When that happens, the interaction levels will increase significantly and so will the conversion rates. The companies will be able to target better and opt for geofencing which will help them address the viewer directly. The more targeted the campaigns, the more interactive they will be for the viewers. Already, the digital signage industry is using beacons to display advertisements aimed towards a particular venue. With the help of geo-fencing, this capability of the digital signage industry will enhance even more. The advantage of the digital signage industry is that it can create a story to lure the viewer. With the help of a proper description, it is easier to convert the visitor. It can use audio, video, sensor-based mechanisms to create the same. It can then integrate it with its online website or social media accounts to make it even more convincing. It is already happening in some parts of the world. While the digital signage industry has a lot working for it but these four trends will surely make it the future of digital marketing. Search emerging trends are making digital signages more and more effective. With such high effectiveness, it is just a matter of time before more advertisers use digital signage to reach their existing and prospective customers. To effectively remove a tattoo, consultation is very important. 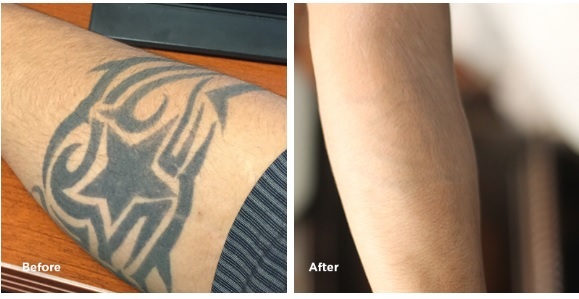 The first step should be to identify a specialist who is able to remove a tattoo effectively and without side effects. According to experts in tattoo removal, understanding the tattoo removal process via TheFinery.net and seeking an effective remedy is very important. You will not only save some money but also avoid unnecessary pain and disappointments. A consultation with a specialist on treatment options for you is important. Secondly, understand that each tattoo is different. In terms of size, type of ink used the age and shape of the tattoo as well as its location. That is why every tattoo removal process needs to be analyzed so that the best approach is taken. A tattoo removal expert will advise you on the best method of removal which depends on the complexity and nature of the tattoo. With an experienced tattoo removal specialist, you will get a better understanding of the process. Experienced and specialist in tattoo removal also work in advanced facilities. If you identify one, then you are sure of getting advanced treatment. The level of discomfort experienced by each person differs. But you may take pain relievers. It is good to check for skin sensitivity first in order to choose what is most appropriate for each person. When you come up with an ICO, you need to take appropriate steps to reach a bigger audience and tap them. Then you will be able to raise the funds that are needed to go forward with your project. This is the main reason why you are encouraged to go forward with one of the reputed ICO localization services. If you take a look at the ICO localization price of Protranslate, you will figure out that the benefits you get are totally worth when compared to the amount you spend in the long run. 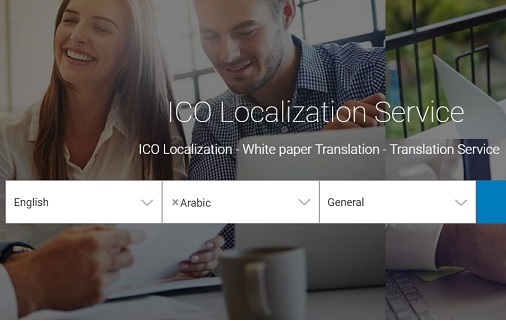 The ICO localization services would adhere to accuracy throughout the process. Therefore, you don’t need to keep any doubts in your mind about the mistakes. They will make sure that all essential information about your ICO is being communicated for the investors clearly as well. In addition, they will write the content in an interesting and compelling language at the time of translation. Therefore, you will be able to use the new copy with confidence and you will be able to get amazing results in the long run. 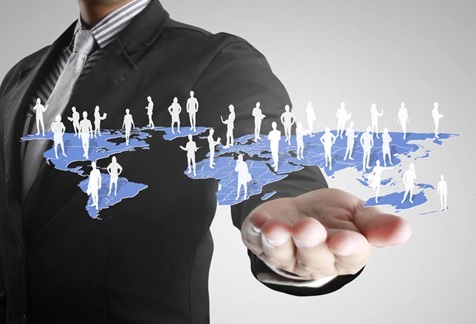 Cultural adaption can be considered as the second main reason why people are looking forward to go ahead with the ICO localization services. You might think that you will be able to translate the content on your own. Yes, that is possible. However, you will not be able to adapt your content according to the new culture. In order to deal with this challenge, it is a must to seek the assistance of the reliable ICO localization services out there. 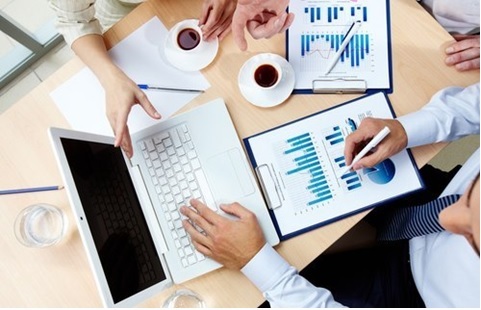 The investors would be provided with feedback by the professional translators as well. For example, they are in a position to manage all the Q&As. Therefore, you can receive excellent assistance with spreading your message. You will also be able to make sure that you are not confusing the investors with the message that you use to pitch. This can guarantee your chances of ending up with successful results. You may own an older version of iPhone and want an upgrade. Don’t worry; you can always update your iOS to the latest version. Updating may require creating more space for the newer version. However, for a novice, updating may prove a challenge. The risks involving loss of data are always rife. Chances are that if not done correctly you may lose those important files. There is nothing frustrating like a failed upgrade due to incompatibility. Considering the amount of time an average upgrade can take (30 minutes) or deleted data to create space for the iOS. It is important to actually find out if your iPhone version can actually be upgraded. This involves confirming if the iOS works with either 32bit or 64-bit. Normally a lower bit system will have complications running a higher iOS that is tailored for a 64-bit system. On the other hand, if you are getting an error while updating to a beta version of iOS, learn how to fix the activation server error on your iOS device. Picture this, you have upgraded your iOS only to start having second thoughts about it out of your user experience. 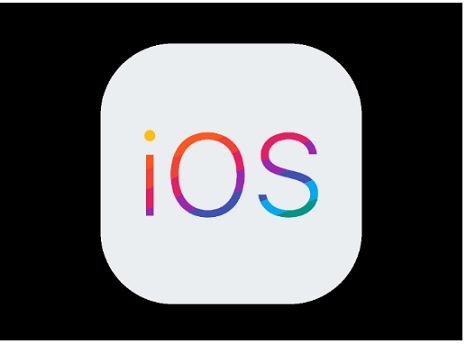 While it is assumed that new iOS is efficient, there is definitely a percentage of users who prefer an older operating system. It may be the case of a new broom sweeps clean but an old broom sweeps better. It is pretty much straight forward. Often a newer version may require space that your iPhone may not afford to offer. The risk of losing data during this upgrade usually lingers. Being an Apple user, this shouldn't prove to be a challenge. iCloud offers an easy to recover option, transferring to your Mac or another external hard disc may do the job. After all, you can always restore or recover the data after upgrading. Certain versions of applications are normally compatible with newer versions. It is important to update your applications so that they run smoothly with your new iOS. To know if you have the latest version of your app, simply check the developer last upgrade date. Apps that haven't been upgraded in over a year (point to developers’ intent) are a possible cause of compatibility concern. iPhone like other phones has hidden files. Junk files, for instance, eat up the memory of your phone. iOS sizes vary from 1GBto 4GB. This is a large amount of space. You don't want to get a storage error message while upgrading after all the hassle. To successfully upgrade, you need to delete files that you consider not important. Hidden and junk files can be cleaned using various iPhone apps. iPhone space saver win is a tool you can use to clean up your phone. The iPhone Umate software has the equal advantage of compressing important photos that you may not want to delete. Cookies, temp files, cache files from browsers and apps are easily cleaned from your phone. The cleaning process is also easy. Simply connect device then scan the files that ought to be cleaned, then you simply tap “release space”. The software then automatically creates space for you. These are the few things you should definitely consider before upgrading you iPhone. While at it, make sure that your data is copied somewhere else to avoid losing it during the update. Document integrity is an important factor for business transactions, which is why almost every company uses the PDF format for sharing and sending business material. Yet with today’s advanced tools, PDFs can now be compromised. Fortunately, PDF signatures are just one of a handful of solutions in detecting and preventing that issue. What you need to accomplish that, though, is an advanced PDF tool, one that is affordable, versatile and secure. In our software reviews, Able2Extract Professional stood out to us as a PDF solution that fit all categories. As a business tool, it has everything you need. We showed you last time how easily it lets you convert PDF to Word on your desktop. 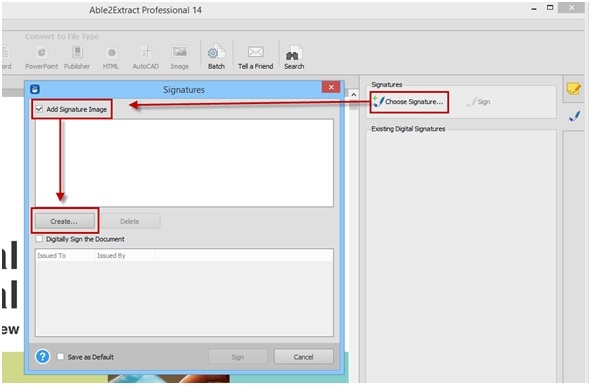 This time we’re taking a look at the latest Able2Extract Professional 14 and showing you the new PDF signatures feature. Below, we walk you through the process of signing a PDF electronically. Electronically signing a PDF document is the most common way to sign documents, which involves signing your PDF with a signature image. This means that you can add a visual representation of your signature to let others know you have looked at, approved or consented to the contents in the document. 1. Open a PDF in Able2Extract. 2. 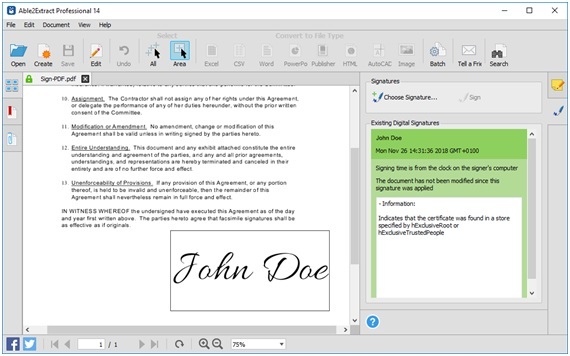 Open the Digital Signatures menu. 3. Click on Choose Signature. 4. Check the Add Signature Image option and click on the Create button. 5. Type, draw or import a signature image. 6. 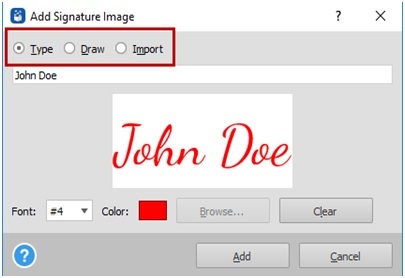 Click on the Add button to create a signature. 8. Save the signed PDF by clicking on the Save button from the Command toolbar. You can create and save more than one signature for future use, which can further shorten the process even more. In addition, you also have the ability to sign a PDF document with a digital certificate by checking the Digitally Sign the Document option. Able2Extract supports digital certificates on external USB devices and will list them for you in the Signatures dialog. All you need to do is select the digital certificate you need and click on Sign. You can also validate digital cryptographic signatures that are attached to PDFs. This lets you ensure that the PDF you’re viewing hasn’t been altered and can check out the details about the signature attached to the file. 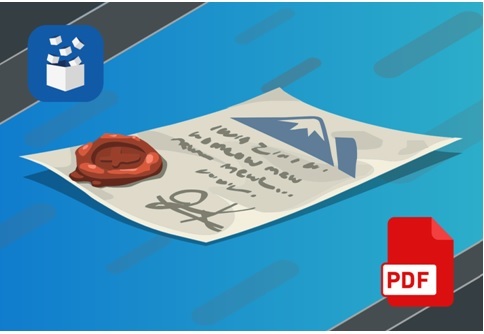 A padlock icon on the document‘s tab and the Digital Signatures side panel gives you quick viewing access to determine the integrity of the PDF document. As you can tell, being able to sign PDF documents is a good, if not essential, feature you should have at your fingertips. You can download Able2Extract free for 7 days from the developer’s site to try this out yourself. No internet required to use the software and you can download it on Windows, macOS or Linux platforms. Buying a smartphone is always a tough work for youngsters because of one bad move and you will be left behind with something that you would not have wanted at all. But there are many reasons that make buying a smartphone a bit fun as well. Nowadays, you have so many companies offering different phones in the same range. So, at times it becomes a bit confusing to select the best pick for yourself. What happens is under the same price tag you get so many options with a little bit of specs difference so you need to be very sure on the fact that what are the right sets of specs that you want in your phone. But things don’t end up here, these days we are inclining towards the online market so much that we need everything at a click of our fingers. To satisfy this need we have some exceptional online platforms such as Amazon, Flipkart, Shopclues and many others. One can get the lowest price mobiles on Shopclues - https://www.couponscurry.com/shopclues-mobile-offers/. There are many considerable discounts, offers, and cash back that they give on their products. They are one of the best leading brands of the online market when it comes to tech gadgets. Since the beginning, Nokia is one brand that has always given their users a chance to be satisfied and happy. But lately after the introduction of Android the company faced a lot of recession but they came back in the market with a bang by launching Nokia 6, 6.1 and 7. 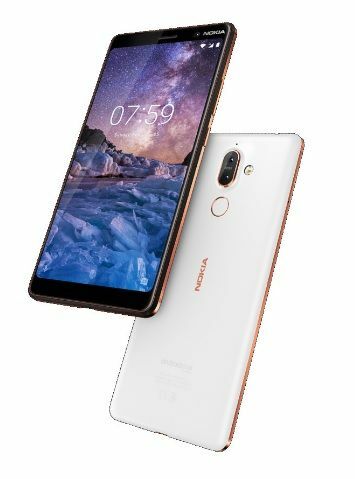 Nokia 7 is a 6 inches full touch screen phone with a Qualcomm Snapdragon processor of 660. They are backing this processor with 4 gigabytes of RAM. To settle scores with photographers, they are providing a dual camera at the back with ZEISS optics. The primary camera clocks 12 MP and 13 MP whereas the front shooter is 16 MP. Say hello to inventions. 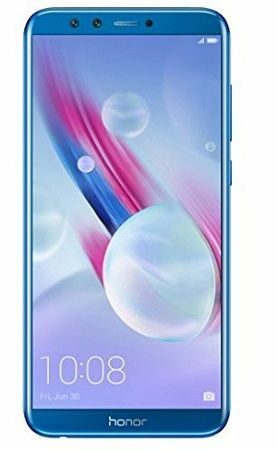 Vivo V11 Pro is a flagship of the company and with the features, they have introduced in it, you would not get it in any of the mobiles at this range. Vivo has been very user cautious because they are trying to put in all they can in their sets without increasing its price. Vivo V11 Pro is crafted with perfection giving a drop notch and an inbuilt fingerprint sensor. 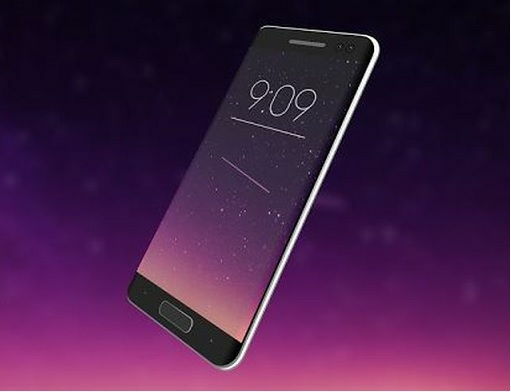 It has 6.41 inches of screen that is powered by Snapdragon 660 and 6 gigabytes of RAM. You can avail a lot of great deals and cash back with the Tatacliq mobile offers online. Asus is one name that has recently come up in the market and has left an impact. They are a company that is giving a lot of promising mobiles to the users at a considerably lower price. 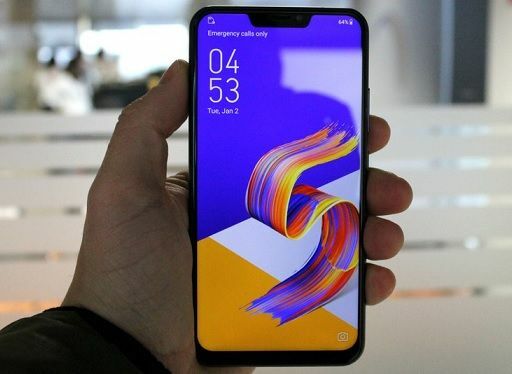 One of their perfect creations is the Asus Zenfone 5Z. This handset comes in with a large display of 6.2 inches. The phone is powered by an octa-core processor with Snapdragon 845 and 6 GB RAM. They have also added to the joy of their users by providing a dual primary camera of 12 MP+ 8 MP and 8 MP front camera. Samsung is a name of trust for a long time now. This is one company that has been providing a lot of cool gadgets to the market. And Galaxy A8+ is one of them. Moreover, the experts are giving a verdict for this phone that in mid-range devices it is just this phone that can challenge the super smooth One Plus 5T. The phone flaunts its 6 inches screen and 16 MP rear and front camera. It has a 6 GB RAM and 64 GB storage. Buying it online from any store can fetch you various cashbacks and offers. To be very frank Honor is one company that is completely underrated due to its budget-friendly devices. The company has inclined their innovations and skills in making compact and comparatively cheaper phones as compared to that of the other companies. And Honor View 10 will cost you somewhere under 30000. 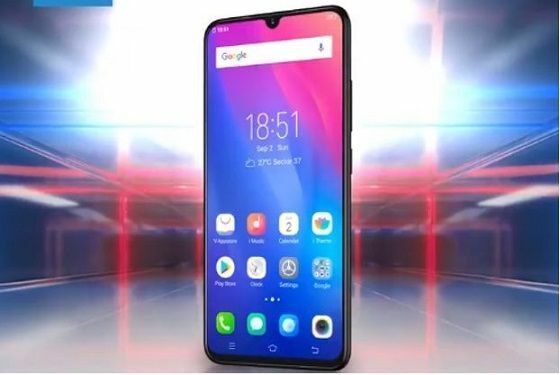 It has 5.99 inches of screen that is powered by 1.8 GHz of octa-core processor and has 16+20 MP of the camera in the rear and 13 MP of front camera. So what are you waiting for, if you are having a budget of 30000 INR then these are the best picks that you can invest in because they will give you a high performance and satisfactory result. Gone are the days when farmers had to rely solely on the whims of the seasons. Technology today can be used to inform farmers of problems before they happen and allow them to make educated choices regarding their crops. Farmers today already use a host of technology on their farms – and if technological advancements are used to their advantage, they may help farmers to complete tasks that were previously out of reach, or very difficult to achieve. But what direction is technology headed in regards to farming? What are some of the technological advancements we are most likely to see in the near future? A phrase often heard in the agricultural world, precision agriculture aims to make farming a controlled, straightforward procedure – letting farmers know what they should be doing and when, and aiming to reduce costs and excess waste. Today, technology plays a huge part in precision agriculture and is used to make farming processes much more streamlined. Widespread automation, or the use of agricultural robots, would allow farmers to gain the same results they are used to with much less physical labor. Using robots to plant crops can help maximize efficiency on farms, and they are already successfully used to this end in farms around the world. The future of agricultural robots includes the monitoring of crops. There are already robots that can detect which particular leaves require pesticides, and the future is likely to hold exciting breakthroughs in this area. Farmers can also use autonomous vehicles to complete their duties. Obstacle detection technology helps to guide these vehicles and ensure the safety of farms and the people working on them. Self-driving cars will soon be a reality, but on farms, the technology is already at the stage where autonomous vehicles can be used with relative ease, and the technology will only become more precise in the near future. Technology in farming isn’t limited to vehicles and equipment on the ground! Drones, a type of remotely controlled aircraft that can be used with a camera to monitor situations from the air, are becoming more popular in agricultural settings. They’ve been around since the 1980s, but their effectiveness in agriculture is rapidly improving, and they are now able to perform tasks that were previously out of reach for anything but a satellite. 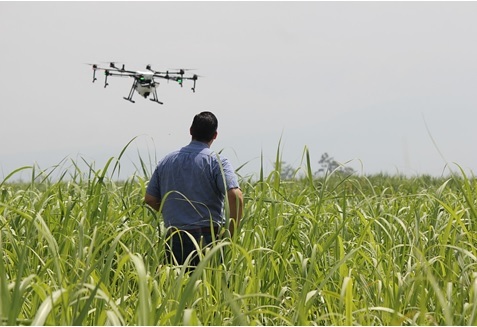 For crop production, drones can be used for planting, spraying, calculating a vegetation index in order to determine crop density, and conducting irrigation. They can also produce 3D maps for soil analysis and assess the health of crops by scanning them. Like agricultural robots, they are especially useful in monitoring crops. Drones are likely to become a common fixture on modern farms as the technology advances; the main drawback of their current use is data quality. Computer applications are also handy for creating maps of farms, allowing farmers to easily gain an accurate view of what needs to be done and in which location. The function and interface of these programs currently need further fine-tuning, but considering the current speed of technology advances, we will likely see flawless applications on the market before too long. Telematics, as it pertains to farming, combines telecommunications, GPS and navigation. By using telematics systems, farmers will be able to create and access data about their farms, monitor their vehicles and equipment from afar, and view information about crops and harvests. 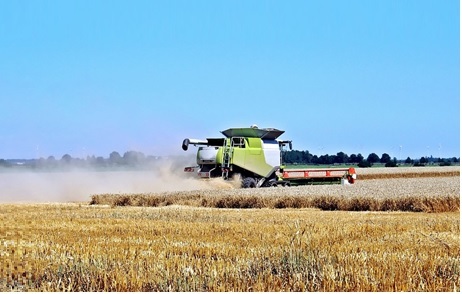 Other industries (such as construction and trucking) already rely heavily on telematics, and it’s seeing a rise in use by the agricultural sector as well. Future developments will likely enable farmers to monitor even more areas of their farms. Perhaps the most rapid (and sometimes controversial) advancement in farming is the use of genetically modified organisms, also known as GMOs. As time goes on, GMOs will become more common, as their use can solve problems that sometimes seem unsolvable. For example, drought is becoming commonplace in some areas of the world, and modifying crops to resist drought is consequently becoming increasingly important. 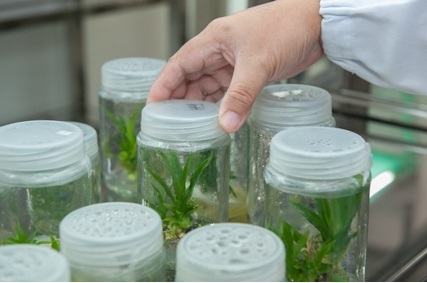 One study examined how using genetic modification might help plants to survive better in drier environments, and found that this was indeed possible – so these plants will survive longer than their counterparts if our future is as drought-filled as expected. This is only one example of the way GMOs can change the future of farming. GMOs also help to ensure crops have the nutritious features we desire while minimizing the features we don’t need, help to create crops that are resistant to disease, and help to reduce environmental damage. 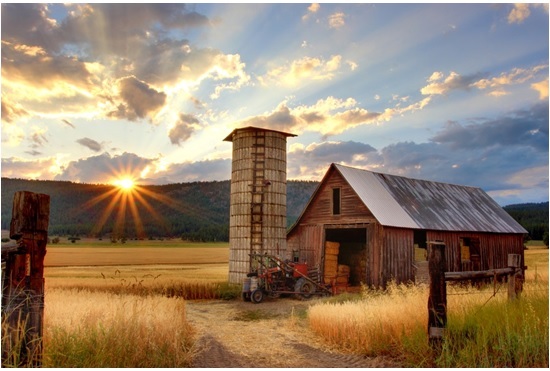 Overall, the future in farming will be interesting to observe to those both inside and outside the field, and we can expect to see serious changes in the agricultural industry in the near future. The advancement of technology can sometimes seem a disconcerting thing, especially to people who work in fields that feel like they’re being taken over by automation – employment in the US agricultural sector does decrease by about 4% each decade, in part because of new technology. The concern about technology destroying jobs is by no means a new concept - consider some of the staples in farming life that would be difficult to live without, and chances are they were once seen as revolutionary. But they are often incredibly beneficial: before the introduction of the tractor, farmers had to rely solely on their own bodies or those of animals, but it rapidly became an integral part of farming life and shows no sign of disappearing. New technologies will likely help farmers to manage their farms better in the future, and their effects on a global scale ought to be positive. In particular, technological advancements will allow farmers to produce greater amounts of food to feed more people, which is especially important as food shortages will likely remain a huge issue. Cloe Matheson is a New Zealand-based writer who loves walking barefoot along sandy beaches (when there are no sharp shells! ), double scoops of strawberry ice-cream with choc sprinkles, and devouring great books. Cloe’s wide range of interests has made her writing style a perfect match for websites such as Sea Containers. Discover more of her work here. When you are in a romantic relationship, you always want to make yourself presentable in the eyes of the other person, as often as possible. You go out of your way to choose the best clothes and presentation style when you go to meet them, and you cannot deny your attraction to each other – love is so exciting, and you cannot wait to spend your time with them. This may seem like a scenario you take for granted, but it applies in many areas of life – even in business. Many business owners strive to make their business as attractive as possible to customers so that they make profits at the end of the day. The best way to achieve this is through branding activities. So they go ahead to hire the best agencies they can find and afford, such as Sixinches.in, one of the top branding agencies in Mumbai – all in an effort to present their best face to the consumer. However, if you are a business owner and are not sure on how to achieve this, how do the best brands in the world succeed? 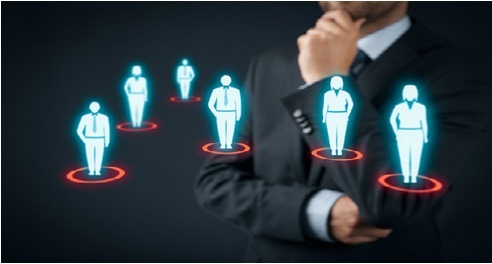 Here are some basic rules of attraction marketing that you can apply. 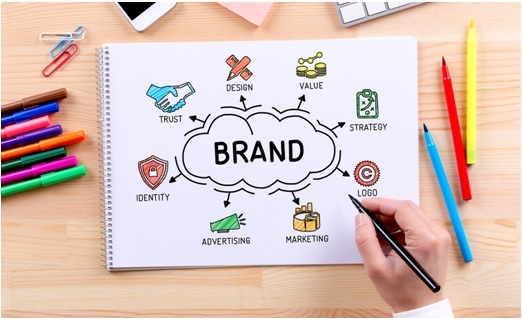 If you are the owner of an enterprise, it is very important to ensure the brand messaging connects to the consumer, as well as fitting their expectations. Part of this involves consistency, and the other part is making sure you fulfill their needs in the best ways possible. Efforts to market your business such as brochures, business cards, mobile apps, and websites should be fully functional and flawless, as well as connecting to the main objective of your business. In addition, it is a good idea to add personal touches to the efforts you make, through making some customized gifts for your loyal customers, which can include the company image and logo. The brand you choose should be consistent in its design, regardless of the platform you use it on, and it should also incorporate creativity and individuality in design. In other words, this will create a ‘halo’ effect on the consumer, making them love your brand thanks to the initial impressions they got. 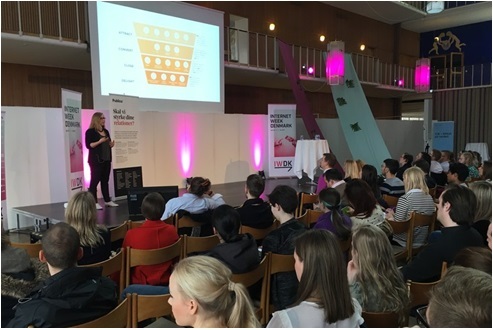 The importance of knowing and understanding your audience cannot be understated enough – it is essential to the success of your business venture. Get to know the details of your customers – their ages, interests, nationalities, socio-economic levels, gender, languages they speak, incomes, psychological profiles, and so on. This will all go into planning your marketing efforts and help you to implement them successfully. This will also help in improving communication with your audience, and they will be loyal because they see you are making an effort to understand their needs and interests. In addition, it will also help you in using the means of communication that the audience is comfortable with, based on where they spend most of their time. One of the major failures a business can do is failing to communicate with their audience in a sincere manner. Make sure this does not happen in your case – improve all the channels to your customers. You can do this by offering better customer support, offering them discounts when they shop from your company, better channels of communication, or awarding them with various rewards. All these will help you improve the customer-business relationship significantly, and there are various tools available that can improve your customer experience. Another way to achieve this is through personalization, which helps the consumers to fall in love with the brand. For example, personalizing their emails, dashboards and offers – all in an effort to understand them and their experiences. All businesses operate to fill in consumer needs and wants. However, the best businesses also seek to create wants, then fill the same void. For you to attract consumers and loyal ones by your side, then you should make an effort to identify and create needs, then provide solutions to those needs. This may seem like a complicated strategy, but it is easily done through conducting market research, through either secondary or primary data collection methods. When you use the second approach, you will piece your data based on previous data that someone else has done. This is using government data to create women’s clothing, for instance – because you do not need to ask the audience if they are female. Primary collection means that you do the legwork in collecting and analyzing data, such as finding out what colors of the products your consumers prefer to have. Once you are able to do your research on the market, you will be in a better position to create services or products to fill the needs of your consumers. Research findings from Harvard Business School imply that when you have a customer retention rate of at least 5 percent, you will increase your profits by at least 25 percent. This is an important thing to keep in mind – so make sure your strategies are geared towards customer retention as well. The Customer Lifetime Value, or CLV, is another essential metric when you want to measure the marketing effectiveness of your branding strategies. This is the prediction of the value your business gets, as long as it retains its relationship with the customers. The most successful brands you know use this information. They are able to increase their CLV as well as their retention rates, and this makes them have a wide base of very loyal customers. These consumers will also do part of the marketing work for them, through strategies such as word-of-mouth marketing. As long as you follow strategies to increase your efficiency, you will attract the right customers to your business and brand. Information technology is something all of us are familiar with. Information technology is at its peak in development. There is an improvement being made every day in the sector of information technology. It has made its ever-lasting influence on everyone in this era. People use digital devices for almost everything and along with an increase in using digital devices, an increase in the usage of information technology has also occurred. We depend on information technology for anything and everything we require. There are many who are literally changing their jobs and are shifting their studies to information technology. This is because of the increasing scope in this field. Even if the person has studied something else, they look for the best online information technology degrees to take up information technology as their career. Joining this sector will definitely pull you into a world of curiosity and inspiration. The trends available in information technology will definitely inspire you and also make you feel more curious about how things work and how is it developed. This is one of the major reasons why the students are being keenly interested in information technology as they get to learn about different and new things and also add to their ideas. Experimentation is done on the existing technology, giving rise to new trends. 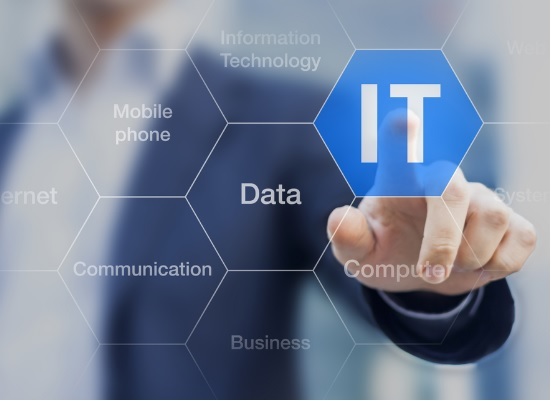 Information technology is changing its phase at a very high rate within no time. Every day a new change or a new update is seen in the fields involving information technology. This is because of the number of people joining this field and its increasing demand. As there are so many of them entering this profession, they come up with their own new and creative ideas for new developments. Few of them enter this field just to learn the existing concepts and maintain those works. They study one of the best online technology management degrees to enter into this field. 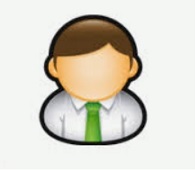 There are many people who switch their fields just by knowing the demand for information technology. The new features and technology being developed in this sector will exceed even the human brains. We will be completely dependent on the electronic devices for all our needs. There was a time when we had to move around for everything but today we do not move anywhere to get anything. This is all because of the development of technology, where we can get any information sitting in our places. Even education which was acquired after walking for long or travelling to faraway places is now on our fingertips Today, everyone prefers online education for which he or she doesn’t even have to travel somewhere else. All that they have to do is look for an online college and apply. They get everything online. ● Artificial intelligence: The ability of the electronic devices to sense things around them and to take immediate action accordingly is called artificial intelligence. ● Google lens: The Google lens is also a developed version of artificial intelligence. Using Google lens you can search for data using images. For example, you take the picture of a Wi-Fi network with its username and password then the device automatically gets connected to the Wi-Fi network. ● Virtual reality: Virtual reality is feeling the presence of something though it is not present with the help of technology. ● Cryptocurrency: Cryptocurrency is another big trend in information technology. It is used for the encrypted transaction of finance. The transaction is completely digitalized and highly secure. ● Blockchain: Blockchain is another form for cryptocurrency which is mostly used by e-commerce websites to ensure the security of the transaction which is recorded and verified. It is widely used for digital assets. There are many other trends which are already available and a lot more are emerging every day. 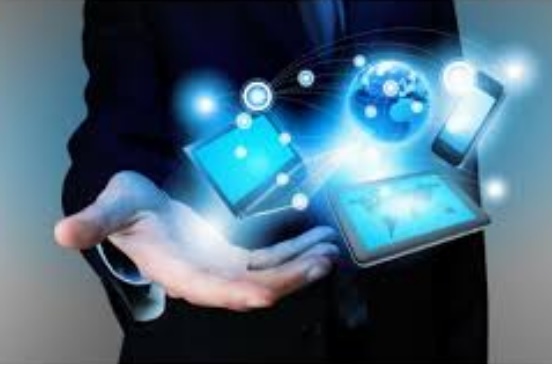 Information technology has gained a momentum and has been developing rapidly. It will always be a platform for development even in the future. Information technology gives a lot of opportunities for students to express their ideas and implement them. It also gives a lot of wide job opportunities to the youngsters with great creative minds. There are many who look to build their career in information technology. All the new trends turn out to be a great inspiration to the young developing minds.